We recently took a trip to cornwall, we haven't been for 2 years and back in Jan i was getting the holiday blues for sure.. so we booked to go camping in Perranporth. Our first family camping trip, not only did we already have a tent but lots of equipment also so this was quite a cheap holiday! We set off dreading the weather not gong to lie.. the forecast didn't look too great for the week but either way we were going and definitely going to make the most of it! Our first trip down was to the Tank Museum, we had been previously in Feb and the kids loved it so we popped in again because we have an annual pass ( you get one if your a gift aider ). We had fun looking around the tanks and the kids got to stretch their legs in the soft play they have. Finally we got to our destination at about 5pm, set up tent and make it a home for the week! i packed some basics so we could have a quick tea, and we had the plug in cool box which was a total must and lifesaver over the week, so Graham whipped up spaghetti Bolognese yum! We stayed at Perran Springs, there wasn't much for the children here but to be honest we wanted it more the a base and nothing else, the facilities are clean, pitches are large and the do have a park! After a bit of broken sleep due to having a crying baby next door, we finally got out of the tent, washed and ready for the day, the sun was shining and we headed to Newquay which was only about 15-20 mins down the road! We spent a few hours 'surfing' the kids had wetsuits and their bodyboards.. so much fun! We did a bit of walking through the hughstreet found a local pub restaurant overlooking the beach called The Font inn which also had a play area bonus! We filled our bellies and hit the slot machines! When we arrived back we booked to go to the Newquay Circus since we noticed it was in town, for £5 each you can't really go wrong and it was a bit of fun for all the family. Day 2 waking up definitely with a better nights sleep we did have a little bit of rain over night but nothing terrible, We decided to go to Screech Owl Sanctuary since we've never really done it, this place was also quite local and reasonably priced, we had a few hours there, they had climbing equipment, a little cafe and lots of owls to see and even stroke! Purely because we still had half the day left we decided to pop to the National Trust locally Trerice. What a beautiful place, the gardens are stunning and you can go look in the house too, the sun was beaming and the kids played bowls on the lawn. Back for showers and Pj's the kids went and layer on the play area which is situated right behind our tent which was a dream, so i could just sit in my camping chair eat biscuits and watch them play. Good morning Thursday, yet again the sun was shining and not a cloud in the sky, our plan for today was to head to Lands End for the day.. Its a place me and Graham have always wanted to visit and it just so happened it was Cornish day so they had lots of things on for the children as well as fireworks in the evening result! Aliser and Graham cooked a yummy eggs and bacon breakfast and we headed off for the day. On the way i found a beautiful National Trust Trengwainton, We stopped off for a couple of hours again they had a few fun things for the children to do and some really amazing looking scarecrows. Next stop Lands End.. £6 parking all day, We decided to do the activities there family of four cost us £27 we had a £2 off voucher we found in a booklet which was brilliant, the visited the 4D cinema which was so much fun, Shaun the Sheep Show room, Arthurs Quest and the farm Down the road, what a bargain! We had to get a good old Cornish Pasty how could we not?! The views were stunning, we did quite a bit of walking, cider drinking and ice cream eating! Theres also a park on site for the kids to play and the parents to chill. 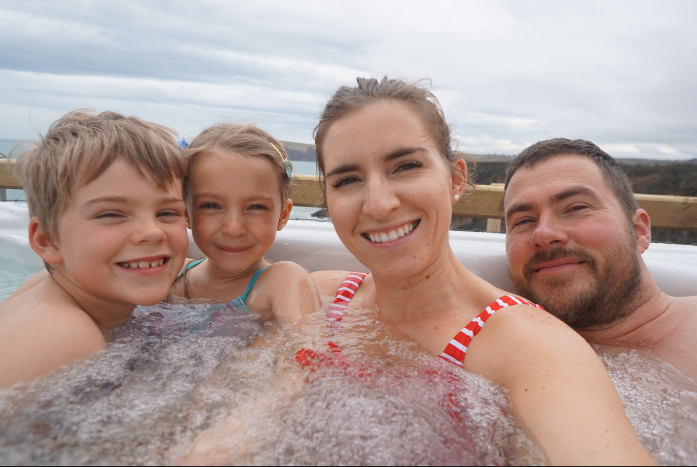 We stayed at Lands End for 10 hours! Waiting for the fireworks at 9pm, We booked into the Lands End restaurant which was really nice but incredibly busy! 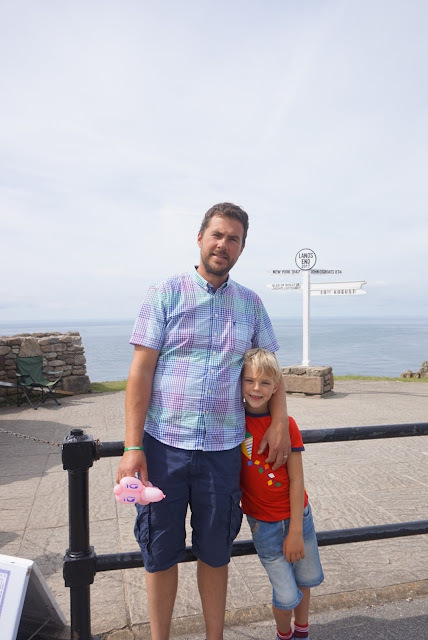 Lands End was definitely my favourite trip of the week, would highly recommend visiting. Friday we headed to Mevagissey which was recommend by my mum! its a lovely fishing harbour / village, very quaint and pretty, we picked up some crabbing gear and tried our luck at that for a couple of hours but sadly didn't do too well, the kids had fun though! On the harbour there are a few free places, the mini Aquarium & local museum which entertained us for a while! The tiniest crab we caught! We had fish and chips on the quay and enjoyed the views and weather, would recommend a visit its a stunning place! Because we had a couple of hours left of the day we popped to Healeys Cyder Farm, Its literally 3 miles from our camp and FREE! you can pay for tours around the orchards and where the brew the cider and make the jam, but generally the rest its free to rome. They have farm animals, goats, horses and rabbits. We went into the restaurant and had cider and cream tea, we tried out some of their homemade jams and chutneys to! I didn't actually film the last day which was Saturday as i just wanted to enjoy my day with the family, however i thought id mention we went to Camel Creek which is a childs theme park place, we had been there already 2 years ago and want to revisit as i thing it will probable be the last time since my kids are getting a little past these rides. We had a cracking day so much to see and do! Animals to hold and groom. Both children held a corn snake and stroked rabbits! Definitely visit if your in the area, and if your organised book a day before you'll get 20% off the ticket price! If you fancy watching our videos of our camping holiday ill leave the link below! I hope this has given you and inset to a few places in Cornwall! Thanks for reading!